I am not codependent, and neither are you. It’s time we drop the label, because the reality is that if you keep identifying with codependency so closely, you’re likely to keep creating the same reality. The codependency movement has been in full swing for a while now. In fact, I used to classify myself codependent proudly, almost giving myself an excuse to act out as an insecure, energy-sucking, people pleasing, caretaker. Now don’t get me wrong. I’m not out to judge anyone. However, I do think that it is helpful if we start entertaining the thought that we can say goodbye to codependency labels. That we can start shedding characteristics of codependency that we identify with. Most of us are the first to admit, yeah, we struggle with codependent characteristics. The fear of what others think, the trying to please everyone, the taking things personal all the time, the enabling, the all or nothing thinking, the walking on eggshells, the allowing of abuse, and so on. We can agree that we’re a work in progress, but there are many men and women who continue to struggle BIG TIME year after year after year… and some decade after decade after decade. This is what I want to see happen less. I want to educate and empower people to radically change their thought life, beliefs, action, and thus, emotions. Step into a NEW SELF so-to-speak. And it probably won’t come with more information. We are on information overload, aren’t we? I’m right there with you on that. I love to read and learn, and I value that for sure. 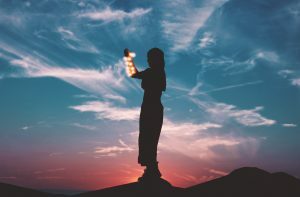 However, there’s one component missing I believe when it comes to really saying goodbye to codependency characteristics, and that’s a regular commitment to mindfulness, meditation, and prayer. I live in the Western world, where we tend to grow up in a fast-paced society that is driven to the core. As children, we feel the stress of our unhealed or wounded parents. For those who grow up in homes where addiction or mental health issues are evident, we tend to grow up with stress hormones having a field day. Sure, short term stress hormones is alright. If you’re being chased by a bee, you’re probably going to freak out and run around like a mad-person. Your heart rate will increase. You’ll be thinking, “OMG, I might die!” (Even though you probably wouldn’t if you got stung). You’ll probably run faster than you thought you could to avoid that perceived danger. Then, once the bee is gone, within a few minutes your body goes back to a restful state. So, you chill out. But what happens in our stressed out kind of world, is that when we’re children (and teens and adults) things don’t go as planned. Or, you pick up feelings like anger, fear, frustration, rage, and so on. And those thoughts and feelings put your body in stress mode. They put your nervous system on high alert – the fight or flight mode. Call it PTSD on all sorts of levels. And then we try to go on to have healthy relationships with ourselves and others. Ok, I’m trying to stay focused here. Research says that about 20 percent of the population falls in the “insecure attachment” group. Meaning, our attachments to our primary caregivers didn’t go as we’d hoped. As a result, we grew up with faulty thoughts and beliefs about ourselves. These became programmed in our subconscious minds. It’s got some programming in there (aka CODE). We’ve been CODED too, and some of that CODE is faulty. If negative thoughts and beliefs can rewire the brain, and you act a certain way because of that, well, positive thoughts and beliefs can also rewire the brain, and you can act a DIFFERENT way! Most people these days know they’re struggling with codependent characteristics. And they’re sick of it (some literally). And they want to know, NOW WHAT? That’s what I wanted to know when I was going crazy emotionally. When I couldn’t handle simple things in a relationship like trusting my partner. Or wrapping my whole world around that person to the point where nothing else mattered. When I was ADDICTED to the craziness around the whole toxic relationship. There are various paths to recovery, but one that is oftentimes overlooked is mindfulness, meditation, and prayer. Not because those routes are easy, but because they are challenging! Now they’re not challenging because they are hard. They’re not. But they do require a consistent commitment to slowing the heck down, and getting serious about this relationship you have with your subconscious mind. Making a commitment to stop affirming an emotional addiction to stress hormones, and using the beauty of thoughts to re-program our minds. Making a commitment to learn how to change our internal state, by living more of an inner journey toward peace and joy, rather than an outer journey. Johnny won’t make you happy. Doing everything for your kids won’t bring you the unconditional love that you so desire. They can add value, but the way to feeling empowered, peaceful, joyful, excited, and grateful comes from inside, and the way to really feel these feelings consistently is through Mindfulness, Meditation, and Prayer. Stick with me here. It may sound odd to you right now, but I assure you that you can experience a new outcome, a new you, when you start becoming an observer of your thoughts and beliefs. When you really make a commitment to doing things differently. There’s a program running you. A code. If you’re not liking how your life is going. Your thoughts, moods, relationships, financial status, etc., look at the CODE. You’ll do this via a daily commitment to mindfulness, meditation, and prayer. A resolve to begin to operate NOW in a state of well-being, regardless of the past, because you realize more and more that mind creates matter. Thoughts create things. Prayer moves mountains. Dear one, feel good now, in this present moment, while daydreaming about the kind of future you desire. Practice. And practice some more, until you’re just….. being in a state of grace.